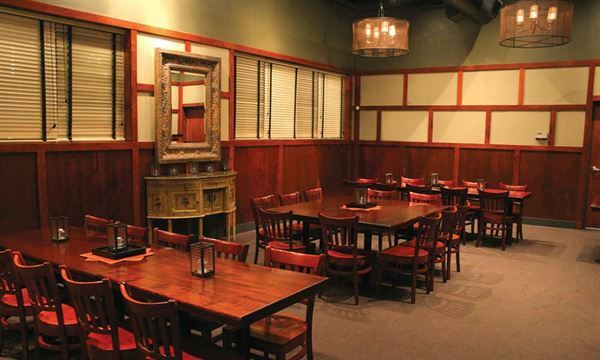 At Iron Hill, we put together private parties and business functions with great care and attention to detail. Our spaces, like the one pictured above, are ideal for cocktail and hors d’oeuvres receptions of up to 45 people as well as sit-down lunches and dinners of up to 35 people. Please select two first-course items and three second-course items for your guests to choose from. One nonalcoholic beverage per person is included in this banquet package. First Course - Seafood Bisque - Kennett Square Mushroom Soup - Strawberry Salad - Caesar Salad Second Course - Red Chile Flat Iron Steak with smoked cheddar macaroni and cheese, tri-colored peppers and onions and chipotle-lime sauce - Moroccan Spiced Salmon with smashed yukon gold potatoes, red onion jam, broccoli florets, scallion sauce and lemon - Chicken Fried Chicken with smashed yukon gold potatoes, wilted spinach, vidalia onion gravy and southern-style cornbread - Meatloaf with smashed yukon gold potatoes, buttery peas and carrots and housemade gravy - Chicken Pot Pie - potatoes, carrots, sweet corn, peas and flaky pastry top - Jaegerschnitzel - pan-fried pork cutlets, herbed spaetzle, haricots verts and roasted mushroom-Wee Heavy Ale sauce Our dessert menu is available upon request and charged based on consumption. See attachment for details and beverage options. Please select three third course items for your guests to choose from. Both first-course and second-course items are automatically included. Dinner includes bread and butter and unlimited offering of nonalcoholic beverages. First Course - Seafood Bisque - Kennett Square Mushroom Soup Second Course - Strawberry Salad - Mesclun Salad Third Course - Pan-Seared Filet Mignon with smashed yukon gold potatoes, asparagus spears and madeira wine sauce - Gold Medal Baby Back Ribs (half rack) Bedotter™ Ale barbeque glaze with coleslaw and wedge fries - Red Chile Flat Iron Steak with smoked cheddar macaroni and cheese, tri-colored peppers and onions and chipotle-lime sauce - Chicken Fried Chicken with smashed yukon gold potatoes, wilted spinach, vidalia onion gravy and southern-style cornbread - Moroccan Salmon with smashed yukon gold potatoes, red onion jam, broccoli florets, scallion sauce and lemon Our dessert menu is available upon request and charged based on consumption. See attachment for details and beverage options.